In my first 30 minutes at the winter NAMM show, I saw two neat kick-drum products. This is the story of the first one, the Kelly Shu. 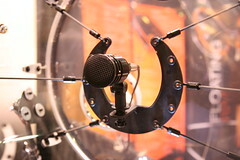 It is the world’s first portable, permanent isolation mount for an internal kick-drum microphone. It looks like a horseshoe (hence the name Shu) suspended in the middle of the drum by bungee cords. When my band was gigging, I grew weary of the haphazard approach to kick-drum miking employed by the soundmen at the (admittedly low-rent) clubs my band would frequent. Usually there would be a floor stand with a D112 (or, on less-happy days, an SM57); it would get shoved unceremoniously into the hole in the drum’s front head. Wherever it landed, that would be the kick sound for the evening. And probably it would be fine, or at least, it wouldn’t stand out as the first thing a professional engineer would fix. But I longed for an upgrade — for a nice mic, permanently installed, in a position that I’d optimized for the specific drum, tuning, beater, and playing style. I had read about the May internal mic mounting system, and it seemed ideal. I eventually bought one of May’s kick-drum mounts, complete with D112. It’s been mounted inside my bass drum ever since. But, in my experience, it doesn’t really deliver on its promise. The mounting arm works itself loose over time, and is impossible to correct by reaching through the small hole in the front head. I could take the head off to adjust it, but that sort of defeats the purpose of the thing. I loved the idea that once I’d dialed it in completely, I’d get a perfect, reproducible kick sound simply by attaching a cable to the XLR jack on top of the shell… Unfortunately, the limited range of motion of the mounting arm, and the device’s tendency to work loose, have prevented me from either finding the ideal position or from keeping the mic in one place. Another challenge for this system is the lack of vibration isolation. There is a rubber isolation mount that allows the mic to float to some degree, but judging from the sound of recorded tracks it seems like I get a lot more attack than I should, as if the shell resonance is being transmitted mechanically through the mounting arm. The Kelly Shu addresses some of these issues — most significantly, it is a true isolation mount. The mic holder is literally suspended by elastic cords. To be fair, my experience with the May system is not universal. The May mount has been used by countless touring bands with great results. For example, I spotted it recently in the Neil Peart DVD, Anatomy of a Drum Solo ; one of the bonus clips on the second disk features Rush engineer Paul Northfield and Peart’s drum tech Lorne Wheaton setting up a D-112 inside the kick drum on a May mount. Click the image at right for a video excerpt. If Northfield couldn’t have gotten a good sound from the May system, I’m sure he’d have changed it. Remember too that on a drum DVD, there’s no mix to hide flaws in — the drums have to sound great. And they do. But Paul Northfield isn’t miking my kit, and Lorne Wheaton isn’t setting it up. So I’m ready to swap my May for the Shu. Installation and initial adjustment might still be fiddly, but it’s certain the mic will be mechanically isolated. And, given that the Shu mount is getting pulled by elastic cords in all directions at once, there’s not much chance its position will drift around once it has been set up. There are two Shus to pick from — an anodized aluminum model that comes in different colors for about $100 street, and a high-density fiberglass model that streets for under $50. I’d love to hear reactions from May and Shu users; please comment below! I, too, saw the Shu within the first hour while planning some interviews for the podcast. The fiberglass version was quite rugged enough. I think I’ll go for one, for sure. I didn’t seem like it was terribly adjustable after the initial mounting but, for what it’s worth, I’m usually in the same ballpark with a stand each time anyway. I have examined the Kelly Shu and the May Miking system. As knowing a good thing when I see it I bought a Shu around the time that they hit the street. I have been extremely happy with it’s isolation and overall “does what they say it will do”. I have heard and seen potential problems with the isolationism of Randall May’s system. But as far as I know, there’s only one internal system for toms and that’s The May Miking System. If there is another out there, please shout it out loud. Thanks. I have not seen alternative internal mic systems for toms (other than the May, I mean), but I will surely cover it here if Kelly or someone else comes up with one. I have the May system. It works fine, but there is definitely a lack of adjustment and isolation. I’m thinking about getting the Kelly Shu because it provides much more isolation. Neil Peart switched to the Shu on his recent Time Machine tour with an Electro-Voice RE20 mic. I just bought the KELLY SHU internal drum mic setup and it works great, played my first show with it this weekend and it sounded great,i used it with my BETA52A, no problems with movement so far, it stayed in the same place i put it. I spoke with the owner directly who answered all of my questions. It took about a half an hour to install, it was very easy to do and i would recommend this product. I’ve been a Regional Artist endorser for the MAY EA miking system since 1987. I haven’t had any major problems, except for the afore mentioned loosened screws and such. I’ve used the system in both live and studio situations with great success. Less experienced soundmen were intimidated at first, but found it easy to work with. 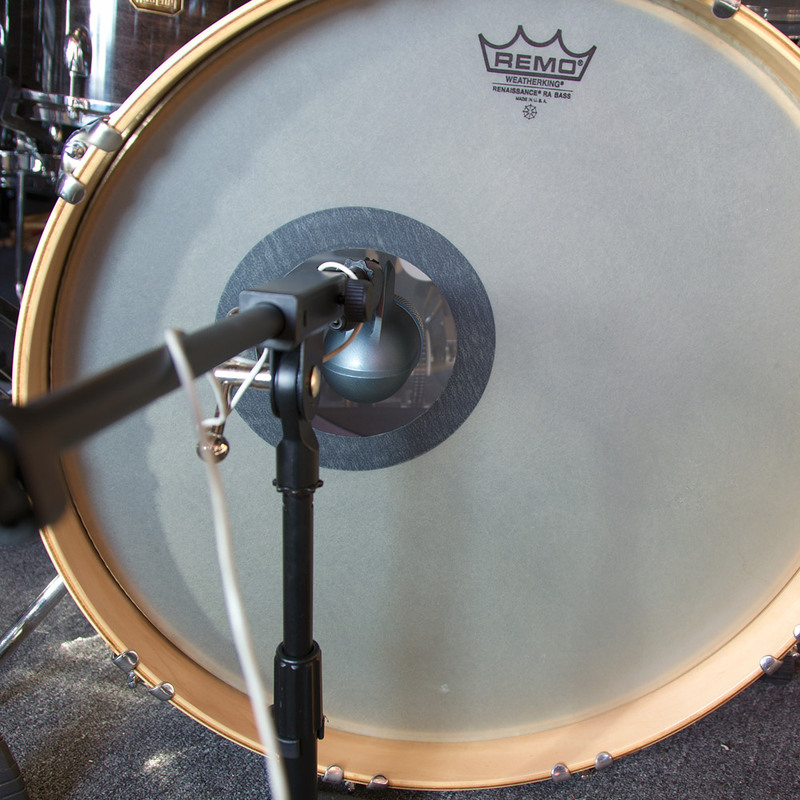 In the studio, for the toms we would blend the internal sound source with external for an enahanced overall sound. For the kick drum we would use the internal D-112, with a YAMAHA sub kick, and an EV RE-20 about 6 feet away within a tunnel, all blended together. I have used May Systems out on tour and 5 out of 10 shows I would have to adjust the mic position because of movement.. I moved over to The Kelly Shu, and the unit stays in place all the time… I use the Pro and Composit… and just picked up the new Kelly Shu Flatz that holds any boundry kick mic… It keeps the mic off the padding. I’ll be using the Shure 91 on the Flatz with a Audix D6 on the Pro. This double set-up is also being used on the 2012 Van-Halen tour. I have the Kelly Shu in all 3 of my kick drums, my larger double bass kit as well as my smaller single kick. They have never let me down! I’m in the process of trying to use the Shus in some of my toms as well. I would prefer to have all of the drums miked from the inside. The kicks are miked with Audix D-6’s and my toms and snare are miked with Audio Technica mics. I agree with some of the other posts. When it comes to toms, May is still the best way to go. I’ve utilized both the XL57’s and a Beta 52 in the large tom. I love the sound of the Beta 52, but that’s a real heavy mike, and I’ve had many problems keeping it in place. The 57’s work a lot better. Only time I’ve had to adjust them is when I replace the heads, and only very slightly at most. As for snare, I do have the XL57 pointed at the snares, and it works ok for live stuff; however, for studio work, I gotta have a top external mike mixed with it. I’ve used the Beta 98 and have mixed both internal and exteral mikes with the INEX Blend Module and have gotten great results. One thing I would really like to try is to utilize the Shure Beta 181/BI with the May mounting system. Have it positioned to where the mike equally picks up both the attack and the snare wires. As for the kick, I haven’t utilized either the May or the Kelly Shu system. My mike of choice has been the Shure Beta 91 placed on the inside of the kick. That mike does wonders for my kick drums. In the very near future, I will mount that mike onto the Kelly Flatz unit. I’ll post my feedback in the near future. One word on may mount screws working lose. I have been using May mounts in toms, snares, and bass drums for over 14 years and lots of gigs. Only once have I had a minor issue with slightly lose screw in bass drum mount/D112. I wonder why a smaller version of the SHU couldn’t be developed that lays parallel with the heads on a tom? Seems like this would work great to me. I am going to make a ply and fiber glassed prototype and see how it works. I think , if estimates are correct, it should only cost about $10 US to make.